Replace Bender Road Bridge over Big Bone Creek. The bridge replacement project will address flooding issues associated with the bridge. The project will resolve structural issues associated with the bridge. 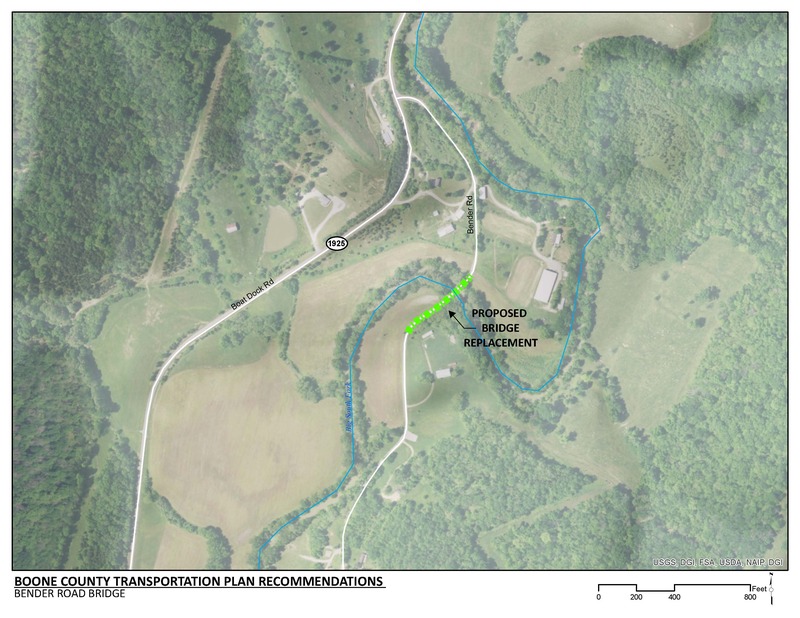 A bridge replacement project in this area will need to avoid or mitigate environmental impacts that may include historic sites, a state conservation area and an agricultural district. Existing Bender Road Bridge is on a local, rural roadway with minimal traffic volumes. This roadway is the sole means of access to several properties. Stakeholder input indicated that this bridge often floods, blocking access to these properties. Existing Bender Road Bridge is on a local roadway that serves rural residential, woodlands and agricultural land uses. There are two potentially historic sites identified near the project. The project is located near Big Bone Lick State Park, a state park and a designated state conservation area. The existing bridge has a sufficiency rating of 44.5 on a scale from 0 to 100, and is classified as structurally deficient.